Growing food will be an integral part of life in the Witchcliffe Ecovillage. Not only is this the most sustainable way to produce fresh, healthy and nourishing food, it is also efficient and cost-effective. Transport miles are non-existent, and packaging and handling is minimal. Producing fresh food for residents on site is by the far the most important sustainability feature of the Witchcliffe Ecovillage. The average Australian shopping trolley has travelled 70,000kms, and the food that the average Australian eats in 10 days requires 100,000 litres of water to produce. These figures are staggering and we are convinced there has to be a better way to feed a village. Each residential cluster in the Ecovillage will encircle a productive community garden, with veggie beds, fruit orchards and chickens, and the entire Ecovillage will be surrounded by small scale intensive farms. All land within the Ecovillage will be organically managed, and all water needed for food production will originate on site. Around 93% of the water budget will be created by the increased stormwater runoff generated by Ecovillage roofs and roads. In conventional subdivisions in the region, this stormwater is usually run through drains into the nearest watercourse, often causing erosion and damage downstream. Here, it will stay onsite and grow food for residents. Community gardens don’t just produce food: they provide education, exercise, social interaction, and community building. Children learn about nature, growing food and healthy eating, adults exchange and build up gardening knowledge, and people share and help each other. Everybody gets to know their neighbours, connections are made and friendships form. At the heart of each residential cluster is a community garden, which will provide the primary vegetable production area within the Witchcliffe Ecovillage. Paths within the community gardens will link each cluster within the Ecovillage, so residents will be able to enjoy the community gardens when walking and cycling through the village. The design of the community gardens is integrated with the water sensitive design within the village. Each community garden contains a rain garden for treatment of stormwater and provides an overland flow path to protect the surrounding lots from flooding in an extreme storm event. 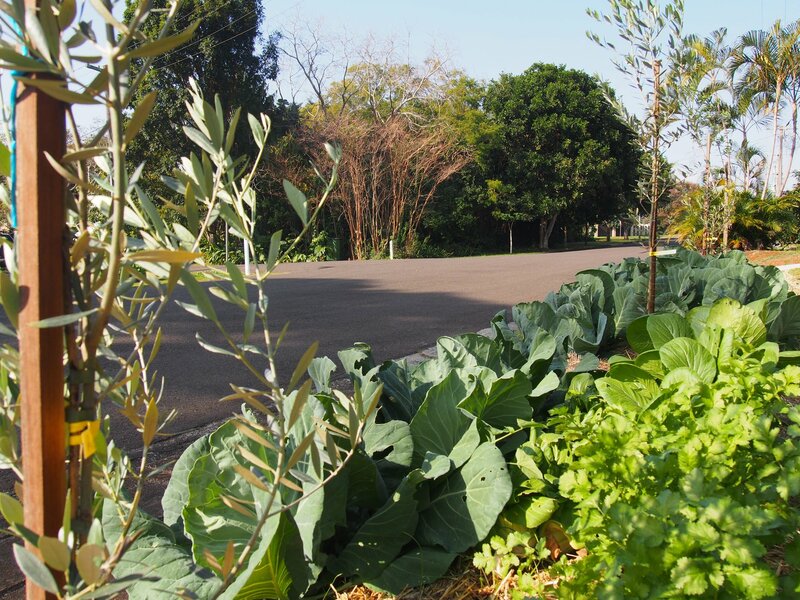 The community gardens will be developed along permaculture principles with frequently visited edible garden beds around the perimeter of the garden close to houses. An area of 20sqm per person has been allocated for vegetable beds sufficient for the community to be largely self-sufficient in seasonal vegetables. Chickens in the community gardens will help with weeding and insect control and fertilise the garden, as well as provide a regular supply of free range eggs for residents. Within the central areas of the community garden will be areas for orchards, poultry and stormwater treatment areas. The community garden will also include a shed for storing garden tools and equipment, a shelter such as a gazebo that will act as a meeting place, and an aquaponics system to grow fish and plants. Paths through the community garden will be provided around the perimeter and have been designed to provide a high level of connectivity from each dwelling, through the community gardens, to the Village Square. Fruit trees will be planted along the paths to provide an attractive, shady environment. Community gardens will be initially landscaped by the developer and will evolve with the input of residents. Roughly 25ha of prime agricultural land surrounding the Witchcliffe Ecovillage has been set aside for small organic farm lots that will be owned by residents and worked to produce food for residents and the local community, growing market garden vegetables, berries, fruit, etc., that can be processed and sold in the Food Hub or local markets. These certified organic and small-scale intensive farms will buffer the village and preserve the rural amenity and character of Witchcliffe. 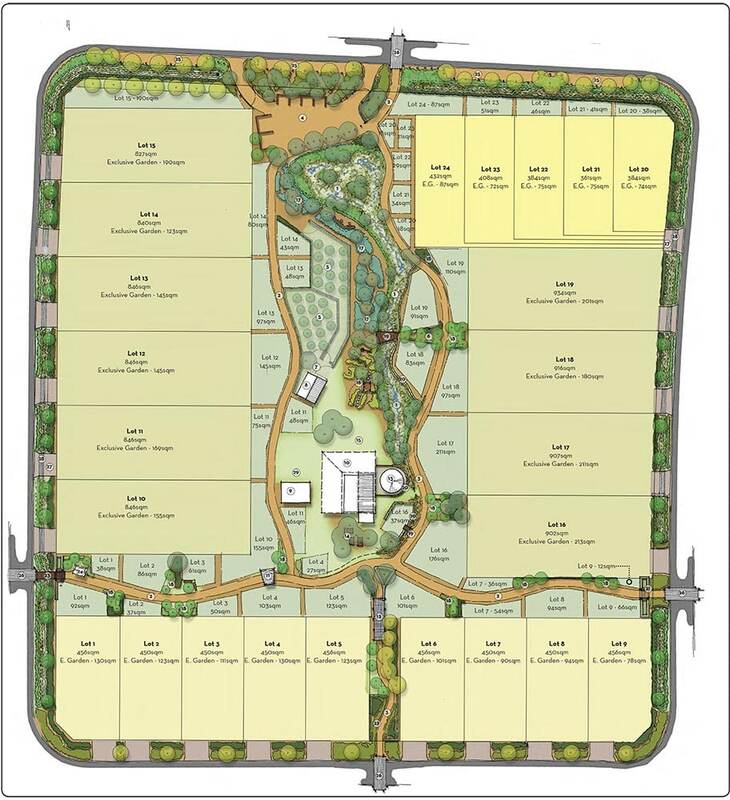 Due to planning requirements, these lots are strictly zoned for agriculture and will not have residences. They have been designed to provide business and employment opportunities for small-scale organic agricultural enterprises and will only be available for purchase or lease to owners of residential lots within the Ecovillage. They are suitable for a wide range of niche organic crops, such as blueberries, cane berries, stone fruit, citrus, garlic, avocados and market garden vegetables. Each agricultural lot will be provided with a water allocation from the Ecovillage dams and will be required to supply their own renewable energy as necessary. One of the agricultural lots is home to the 6ha organic Foxcliffe vineyard, developed in 1996 by Cape Mentelle wines, which continues to grow premium quality Cabernet grapes. Making a living from a small farm can be challenging, especially with high costs for transport and marketing, and low wholesale prices paid to farmers. The Food Hub is the heart of our fair food distribution network, a collective space for organic growers to wholesale, retail, process, and value add their fresh food produce. This commercial site located in the Village Square is anticipated to be built once the Ecovillage has been fully developed. 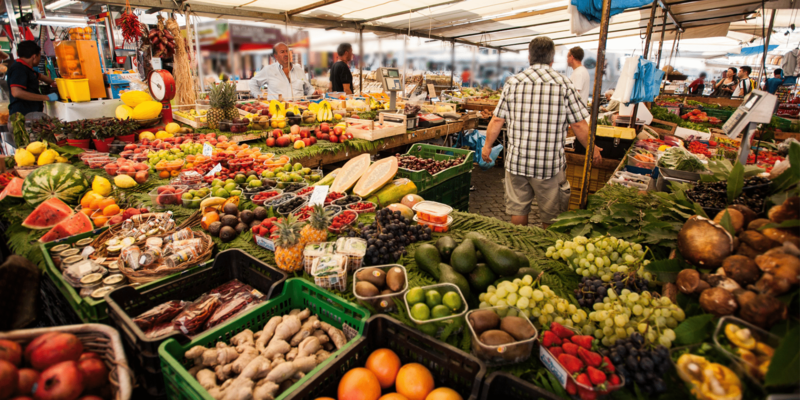 In the early years of the Ecovillage, growers will be able to sell their produce directly to residents through organic growers markets held in the Village Square. The Witchcliffe Ecovillage strata body will collectively own over 38ha of community open space outside of the community cluster gardens, which will include olive groves, nut trees for oil production, wood lots, a locally indigenous bush tucker garden in the Village Square, and a mix of native and productive street trees for all to enjoy and share. Photo courtesy of URBAN FOOD STREET.